European Automation Projects have recently completed the installation of the iSupervisor TAS tanker loading package complete with iMonitor tank gauging system for Nolan Oils depot close to Bicester. The company have replaced two legacy systems one for tank gauging and a separate one for tanker loading with a combined web based package with full product reconciliation functions. The system is controlling two tanker loading skids utilising Contrec 1010 batch controllers, one existing and one new. The system also includes a full i-Monitor Tank Gauging System which has been installed using Hectronic level instrumentation, providing accuracy of 1mm of product level and also giving temperature and water level information. EA Projects supplied a turnkey tank gauging system including design, equipment supply, full electrical installation and commissioning services and on this occasion worked with a third party skid manufacturer on the tanker loading package. The system is installed on the EAP web platform supplying remote access to all system functions via the internet. 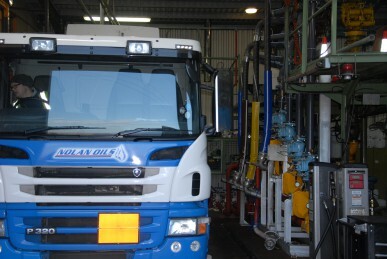 "We are very pleased with EA Projects installation at Nolan Oils depot in Bicester. Simon and the team have an extensive knowledge of the requirements of an oil storage depot and of the checks and calibrations that we now require from this equipment. The installation was seamless with very few problems arising considering some of our equipment we retained was not as new but EA Projects installed the system without disruption to the day to day workings of the depot."